Kung Fu fighting, Chinese calligraphy and origami messages in a bottle were order of the day for the Clipper Race crew and Skippers who were invited to a local primary school as part of Qingdao’s cultural exchange programme. 400 children from the Zhu Jiang Road Primary School, which specialises in sailing, hosted a mini-festival and variety performance which began with the crew being greeted by the sound of the orchestra and adorned in red scarves by the young pupils. Derry~Londonderry~Doire crew member Rebecca Ormisher, who sailed Legs 1 & 5, said: “The children are all so cute, really well-mannered and keen to practice their English with us. As soon as we arrived they were running over, putting scarves on everyone, telling us their names, ages and they’ve all given us a lesson in Chinese calligraphy. As is tradition in China, the hosts and visitors exchanged gifts. After Sir Robin's welcome speech, Clipper Race CEO William Ward presented the school with an image of the Qingdao yacht that is representing China's Sailing City on its round the world adventure, receiving art work in return. After that, each of the teams was represented by their Skipper or a crew member on stage and they handed over a large printed image of their yacht, in return receiving a large scroll of Chinese calligraphy. After each performance on stage, whether it was by the musicians, dancers or Kung Fu fighters, once they had finished, the crew were invited to get involved and try everything out for themselves. As some tried to mimic the children’s impressive gymnastics, others were talked through the latest robots and gadgets they had built in their technology lessons. 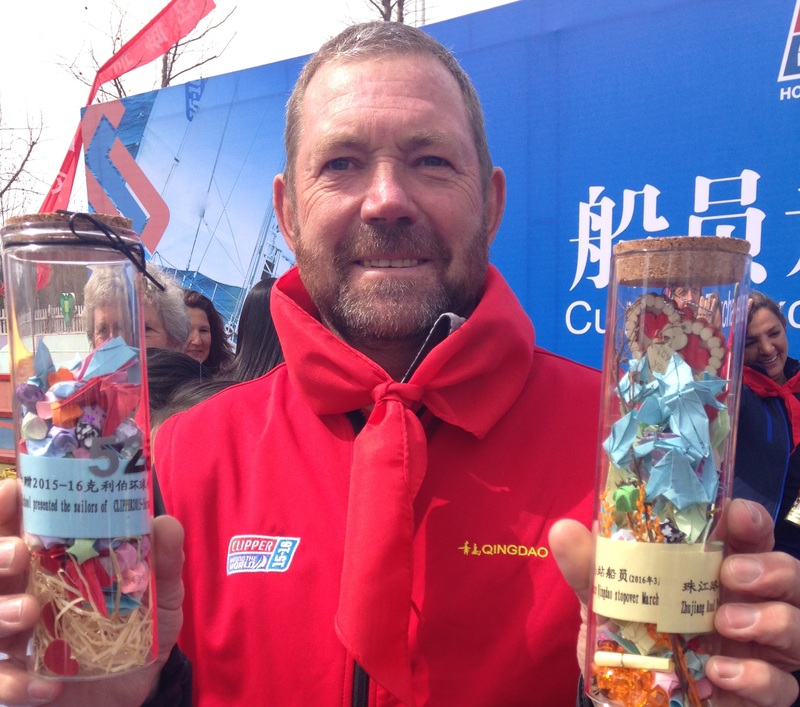 The stopover is the first time Qingdao Skipper Bob Beggs has ever been to China and he is impressed with legacy the Clipper Race has here. Bob’s wife Carol, who is visiting stopover for the first time in either of Bob’s races as a Clipper Race Skipper, added: “It’s really important to come out and support the Clipper Race and the teams. This morning’s event was just amazing, they all made us feel so welcome. All the children were running around trying to give us all gifts and just trying to please us really. They were just so excited to see some of the crew and their faces lit up. It was nice to see them so happy. The Qingdao Organising Committee is putting on a series of cultural exchange days during the stopover, including a visit to a local community in the Shi Nan district where the fleet is berthed, and another to the farmlands outside the city.